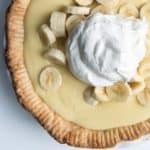 Buttery pie crust filled with freshly sliced bananas and an easy-to-make homemade custard (thanks to a secret weapon) make this the most delicious old-fashioned banana cream pie ever. This is going to sound oxy-moronic but this easy, old-fashioned banana cream pie is made in the microwave. At least the filling is. The crust gets blind-baked in the oven the normal way. You can totally cook the filling on the stove if you want to, but the vanilla custard comes together ridiculously fast and with basically zero risk of burnt milk and scorched pudding coating the bottom of your pan when done in the microwave, so….. 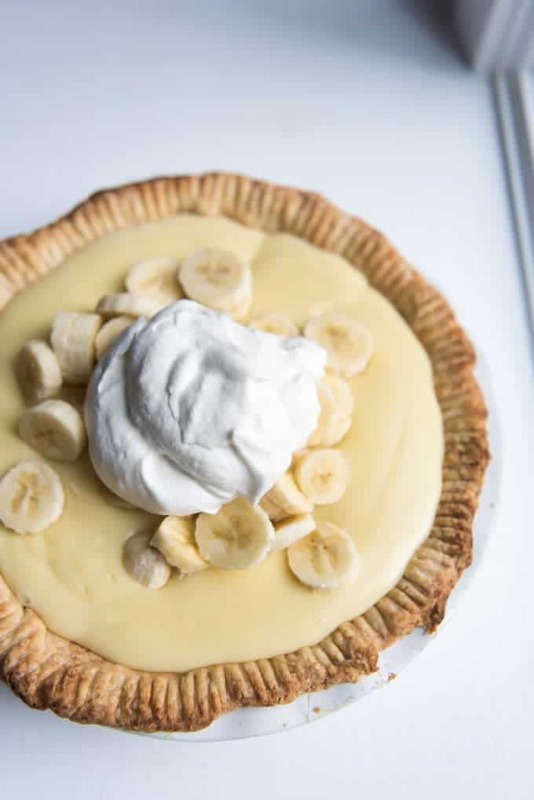 It feels like cheating to make a pie in the microwave but when it turns out as delicious as this homemade banana cream pie does, I’ll shove pride aside and cheat all day long. 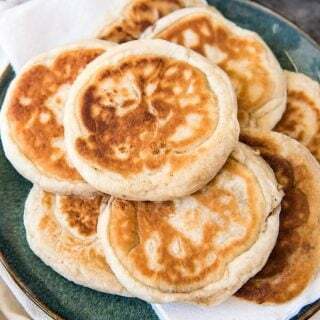 Way back in my college days in good old Provo, Utah at BYU, I was dating this really cute boy (who I ended up marrying) who would come over for dinner almost every night, whether I was the one cooking or whether it was one of my roommates turn to cook. (Anyone else do the roommate dinner rotation during college? I loved it and miss those days!) Paul was that fixture boyfriend who was ALWAYS around in the apartment full of girls and he was strategic about befriending my roommates in order to secure his place in my life. He loved having conversations with each of my roommates about the guys they were interested in and analyzing the minute and complex social interactions that go into dating at BYU. It’s probably why he’s still such a fan of “The Bachelor” and “The Bachelorette” (for reals, it’s one of his favorite shows) – it takes him back to his days of playing some version of Chris Harrison with each of my roommates. So when Paul mentioned that banana cream pie was his favorite, I decided that it was time to lock this boy down with my mad baking skills. Except that I made the mistake of attempting to make this pie while Paul was there with me. Which proved to be an insurmountable distraction (it is super hard to focus on a recipe when things are getting a little too hot in the kitchen and I’m not talking about the temperature of the oven) and I completely spaced adding something to the custard while it was cooking. I don’t know whether it was the eggs or the cornstarch that was missing but the vanilla cream pudding just would not thicken properly. I think I cooked the filling more than double the regular amount of time before getting exasperated and giving up. Paul kept saying how much he loved “banana cream soup” and thought it was “cute” that I was frazzled. 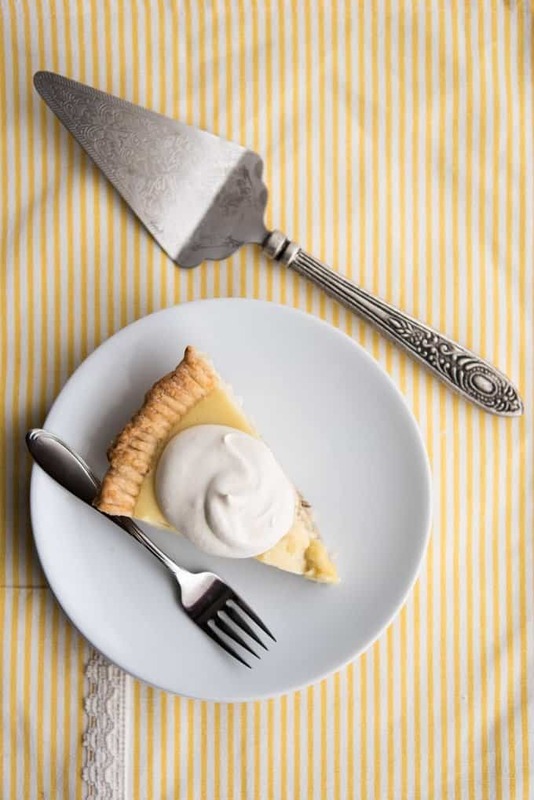 And every time I make this pie, I think back to that day in the little kitchen south of campus with my infuriating boyfriend who I wanted to impress with the perfect banana cream pie. 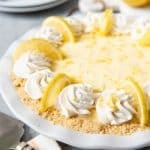 Despite that one failure, this banana cream pie is super easy to make! 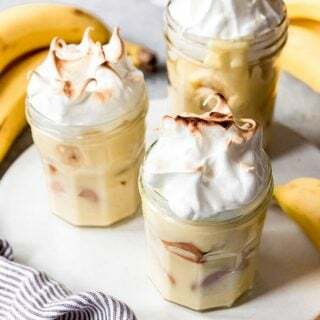 Don’t be intimidated by making the pudding filling from scratch because it isn’t hard at all and the resulting banana cream pie will be the best one you have ever had in your life. 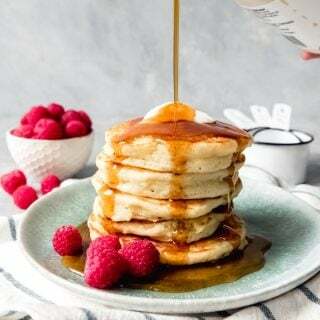 It’s just sugar and cornstarch, whisked together with milk and egg yolks, with a little butter and vanilla stirred in at the end! For the rest of the pie you just start with a pie crust for a single pie (or go ahead and make the double pie crust recipe and do a blueberry sour cream custard pie to go along with the banana cream one at the same time!) which you blind-bake ahead of time. 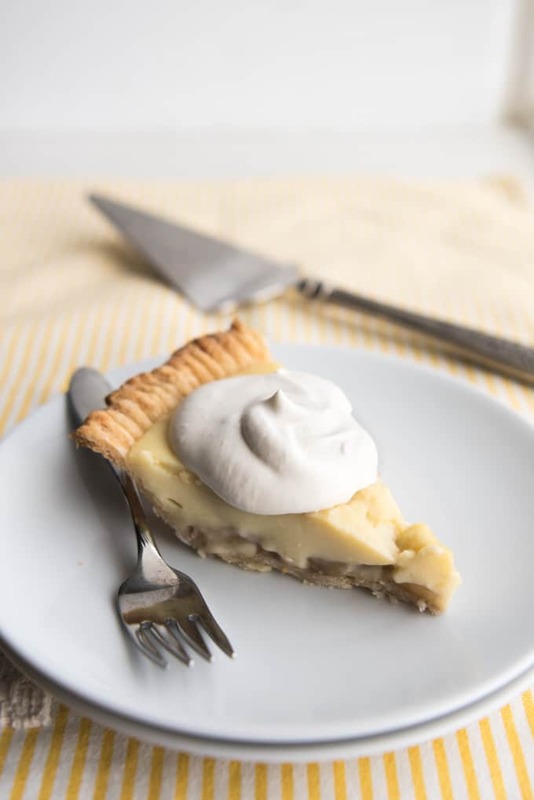 For banana cream pie, I like crimping the edges of my crust with the tines of a fork for decoration just because it is so easy and looks even more old-fashioned to me. And then it’s just about slicing bananas and whipping the cream. If you want your pie to set up so that it can actually be sliced and hold it’s form like in the photos above, then you are going to want to make it enough in advance that it can cool completely and set up in the refrigerator for a couple of hours. But in all honesty, we prefer eating banana cream pie warm even though the “slices” of pie don’t hold their shape and need to be scooped out with a spoon. It’s so, so good that way. But it’s just as good the next morning when the pudding filling has set up. If there is even any left by that point. 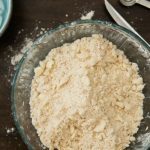 Prepare your pie crust and roll it out into a circle a little larger than the size of your pie pan so that you will have enough overhang for a crust. Carefully roll the crust onto your rolling pin and transfer to your pie pan, laying it in gently. Trim away any excess crust, leaving about a 1/2-inch extra around the edges to tuck under for a clean, finished looking crust. Crimp the edges of the crust with a fork and poke holes all over the bottom and sides of the crust (it's a process called docking and it lets steam escape from the crust to prevent shrinkage and bubbles) before blind-baking it in the oven at 400 degrees for about 30 minutes, or until the crust is golden brown. In a large microwave safe bowl, whisk together the sugar and cornstarch. Gradually whisk in the milk. Cook in the microwave for 6 to 10 minutes, opening it every 2 minutes to give it a quick stir, until the mixture is thick and bubbly. Once it starts to bubble and get thick, cook and stir the mixture for another 2 minutes, then remove from the microwave. 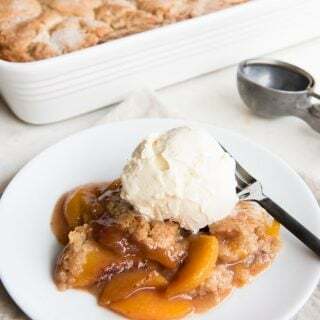 This can also be done on the stovetop in a large pan over medium heat, stirring constantly to make sure the pudding doesn't scorch on the bottom. In a separate bowl, lightly beat the egg yolks. Temper the eggs by slowly adding 1 cup of hot milk mixture to yolks, whisking while pouring to avoid scrambling the yolks. Pour the tempered egg mixture back into the hot milk mixture and whisk to combine. 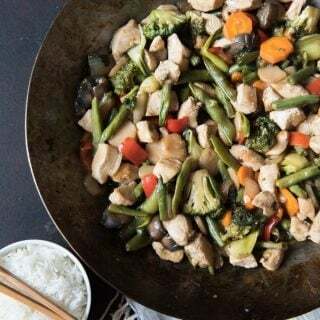 Return to the microwave and cook for another 2-4 minutes, until it is bubbling again, or if using the stove method, bring to a gentle boil for two minutes. Remove from the microwave and stir in the butter until melted. Add the vanilla and stir. Slice 2 bananas and arrange the slices on the baked pie crust into an even layer. Pour the hot vanilla custard filling over the bananas, then allow the pie to set for 30 minutes before serving warm. Alternatively, you can chill the banana cream pie for 4 hours if you want the custard to set up more before serving. 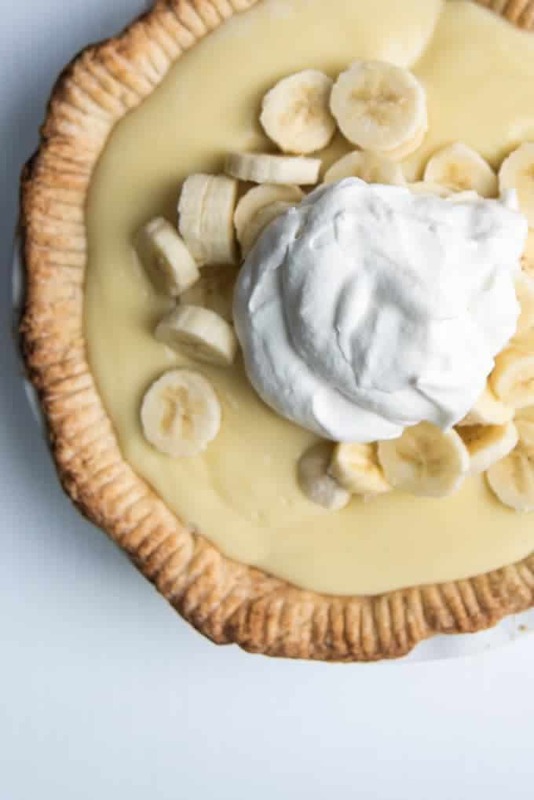 Just before serving, top the pie with additional bananas slices and freshly whipped cream. You can get my perfect pie crust recipe by clicking here! The microwave! You just changed my life! We make a very similar custard-based banana cream pie recipe, and I’ve been doing it on the stovetop and it takes forever. Thank you!! 🙂 Your comment made my day! I felt the same way when I realized I could use the microwave to make my custard! That’s wonderful to take a lot of the standing over the stove top forever stirring away!!! 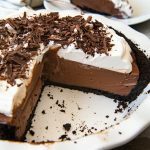 Would you know how to tweak this recipe to make chocolate pie in stead? That’s my DH’s favorite. You know, B, it’s something I need to work on! I’m sure it’s possible but I just haven’t tried it yet! 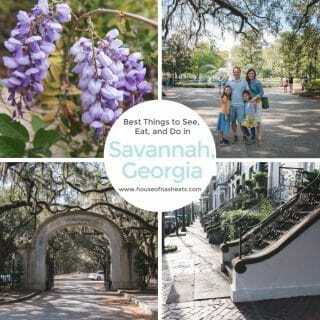 It’s on my list though because my husband loves chocolate pie too! I have definitely been frazzled cooking for my partner when he was watching. Banana Cream Pie is my husbands favorite too. His mom makes it in the microwave! Its delicious! I didn’t even like banana cream pie before the microwave version. Yours is very pretty too. Thanks, Kate! I got the microwave trick from my mom too! Before Cool Whip and instant pudding, this was how a cream pie was made. If you leave out the bananas, you have vanilla cream pie. If you add 1 cup shredded coconut to milk as it’s being heated, you have coconut cream pie. In a small bowl, have the 3 egg yolks, slightly beaten, ready; stir a small amount of the hot mixture into beaten yolks; when thoroughly combined, stir yolks into hot mixture. OH wow! This pie looks so amazing! 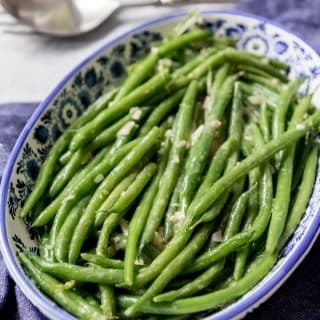 I love that you can make the filling for this in the microwave! Looks delicious!!! It is hard to cook and flirt at the same time! What a cute story. This pie looks scrumptious but I’m sure he like the soup version just as much! Thank you so much for your review! 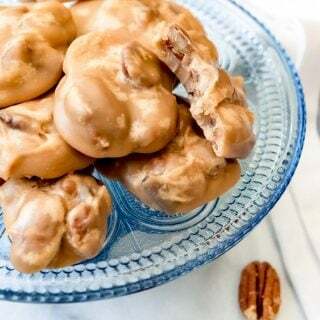 I’m glad you like the recipe and that’s good to know about the sugar substitutions! And I would love to try the honey caramel layer! Yum!